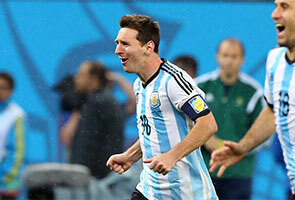 National hero Lionel Messi and team are playing one of the most important matches in the football-mad nation's history. Anxious, excited and immersed in superstition, Argentines prepared a massive party Sunday for what the media described as "the game of their lives," hoping to claim their third World Cup title. National hero Lionel Messi and team are playing one of the most important matches in the football-mad nation's history, and Argentines could speak of little else as they loaded up on food and drink and went through pre-game rituals. "Out of superstition, I'm going to wear a shirt that I haven't washed since the World Cup started and that I've worn for every match since we kicked off against Bosnia," said Martin Gonzalez, a 35-year-old engineer, as he stocked up on beer in Buenos Aires's upscale Palermo neighborhood. Media reports speculated that President Cristina Kirchner, who declined host Brazil's invitation to attend the game in Rio de Janeiro's Maracana Stadium, was staying away because she was afraid of being branded a jinx if the team lost. The local press had room for little else Sunday, and TV stations displayed a running countdown to kick-off at 4:00 pm local time (1900 GMT). "Glory is there, within arm's reach," wrote daily La Nacion. Rival paper Ole carried a front-page picture of Messi beside Rio's iconic Christ the Redeemer statue with the headline "I only ask one thing of God." Argentina treats football with the reverence of a religion, but the national team has not been to the World Cup final since 1990, and has not won it since 1986. Winning the final would be a huge boost for national self-esteem at a time when the country is mired in economic troubles and struggling to pay its defaulted debt. "I'm living these final hours in a state of extreme anxiety, nerves, hope, emotion and anguish. For Argentina, it's the greatest thing that could possibly happen, not just on the level of football but as a country," said German Vazquez, a 33-year-old real estate broker. An estimated 100,000 Argentines are expected in Rio on Sunday, taking charter jets or driving in convoys of cars. Many made the six-hour trip from Sao Paulo, where Argentina beat the Netherlands in the semi-final on Wednesday. Back home, their compatriots are decking the country out in sky blue and white and plotting the best spot to watch on TV. 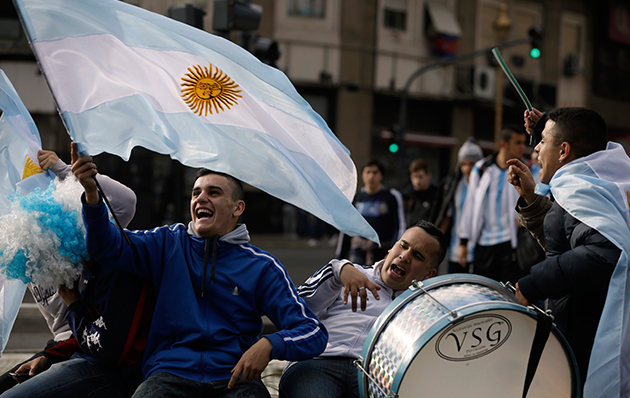 The heart of the party is Plaza San Martin in Buenos Aires, where 50,000 people gathered for the semi-final and many more are expected to watch the final -- if the morning sunshine defies the rainy forecast for later in the day. The city put up additional jumbo TV screens for the fans, including one in the plaza that measured 26 square meters (280 square feet) and another in Centenary Park that measured 66 square meters (710 square feet). If Argentina wins, millions of people are expected to descend on the capital's iconic Obelisk in celebration, rain or not. Police said they would reinforce the city's hotspots in the event of a victory. "Wherever there are jumbo screens, there will be more police, with special attention on Plaza San Martin and Centenary Park," a federal police spokesman told AFP. In residential neighborhoods, Argentine flags sprouted on balconies in abundance, while stores, bars and restaurants posted signs saying they would close early or stay shut altogether. Across the country, communities were planning day-long festivals building up to the match. From Guaymallen in the west to Gualeguaychu in the east, cities and towns organized children's activities, theater festivals, concerts, football tournaments and fairs. Foreign journalists have descended on the country seeking the best spots to chronicle the excitement. Hotels around the Obelisk and Plaza San Martin are charging $500 to $800 a night for the rooms with the best views of the festivities. Messi and his teammates are expected to arrive back in Buenos Aires on Monday morning -- either to a massive party and parade to the city center, or to the heartbreak of 40 million disappointed fans.